The plan is to gradually expand this section to include the large Bohanna Collection, as well as showcasing pots from other collections. If you have good quality images of treacleware which you would like to add to this gallery then please contact me. I may also be able to help with photography if needed, depending on distance. I may be prepared to travel if you have a significant collection or even an important piece. And all contributions will be fully acknowledged here on the site as well as in any publication in which the images are used (but only with your permission). Small treacleware teapot with applied white clay flower sprigs (‘bas-reliefs’). These teapots are closely related to so-called ‘Bargeware’ or Measham ware, also known as Canal boat ware. 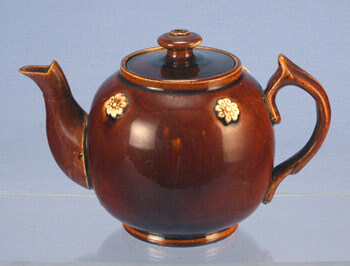 These simple treacleware teapots were made in many potting centres around Britain throughout the 2nd half of the C19th. In 1988 I recovered a group of kiln wasters from the Pountney & Co phase of the Bristol Pottery which included a significant quantity of these teapots in various sizes. The wasters dated to around 1870-1890, and a small selection of examples was deposited with the Bristol City Museum & Art Gallery. 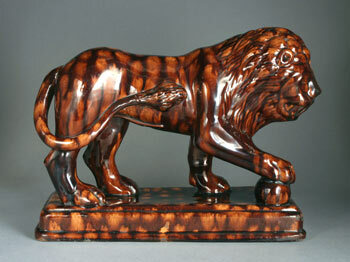 A large and highly impressive two-tone treacleware lion figure. One of a pair. Probably made in Staffordshire c.1830-1850. This figure is based on the Italian marble originals which stand outside the Loggia dei Lanzi in Florence. These lions were later copied by the Bennington factory in Vermont, USA, though the American versions usually have applied textured hair (made from thin strands of clay pushed through a sieve, or clay granules). These British lions, which are earlier than the American examples, occur in several versions. The best examples have beautifully controlled two-tone colour. 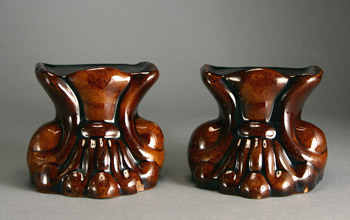 A pair of treacleware furniture feet rests. These are not sash-window supports, despite how many times this fallacy is repeated. These occur in a vast range of moulded forms including lions, faces etc. This pair are paw-like in shape but probably depict bunched/tied drapes(?). Often found in groups of four or pairs. Made circa 1840-1870 (? ).